Skincare is a topic I used discuss quite a lot on this little space of the internet, especially when I first started blogging it was massive hype to have a 7+ step skincare routine which I know works for some, but truth be told my skin likes things just plain and simple. I thought it was about time I shared an updated kinda cleansing routine with a few fab products that my skin has been loving of late. 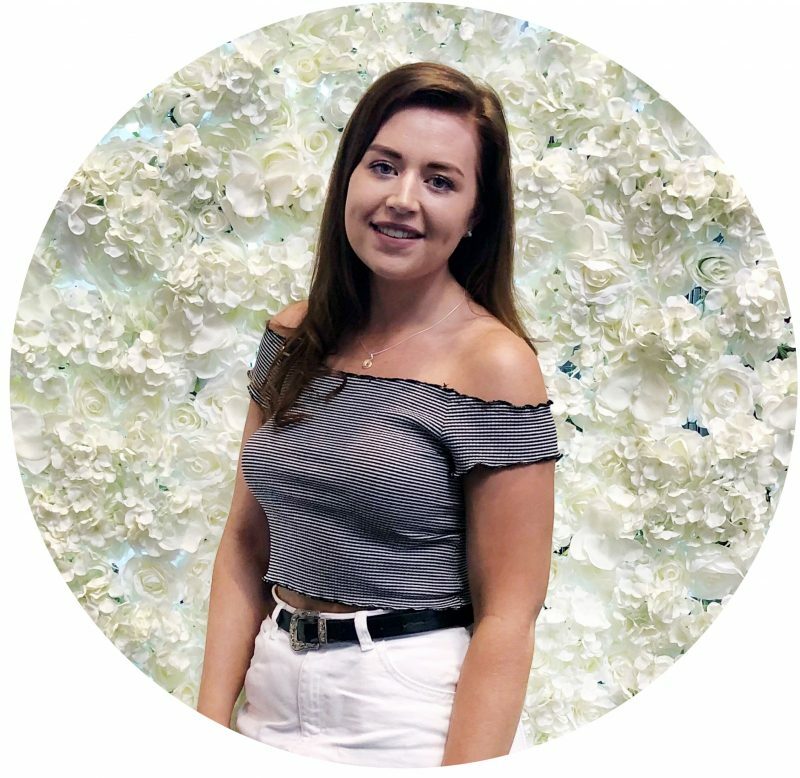 Continue reading to hear more about the products that have got my skin in the best condition it has ever been in! My skin has changed so much over the years but i’ve always suffered with spots on the chin region, with contraception being the main cause of this but I also suffered through my early teens. There are just areas of your skin that are going to do what it wants to do and you’ve just got to find products that work for your skins needs. For months i’d been using an oil based cleanser and it wasn’t until my skin literally erupted that I realised oil based cleansers are definitely a seasonality cleanser and not an all round cleanser. So I was back to the drawing board and after a few trial and errors, i’ve finally found a two step cleansing routine that my skin seems to love (for now). 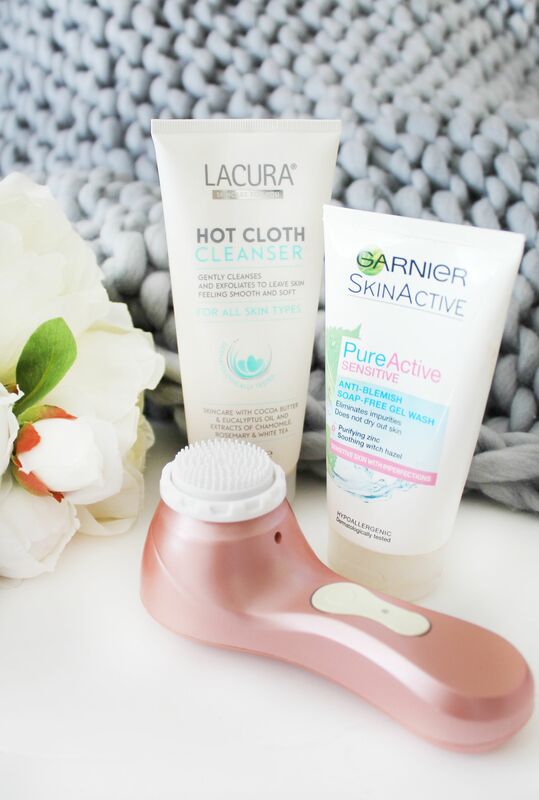 Starting off with my favourite cleanser of 2018 and one i’ve repurchased every time i’ve seen one in Aldi because i’m so scared of them discontinuing it, and this is the Lacura Hot Cloth Cleanser (£3.99). As I mentioned in this post, this is a dupe for the Liz Earle Cleanse & Polish only without the ridiculous price tag. I typically use this as my first step in my cleansing routine, applying all over my face and massaging in to help break down any makeup. I then go in with my Magnitone Barefaced Shimmer Cleansing Brush* (£90) and go over my entire face with this brush to get into the contours of my face. Ever since I started using this cleansing brush as part of my cleansing routine, i’ve noticed such a massive difference in my skins appearance and if I go just a couple of days without using this my skin freaks out. If like me you’ve struggled with acne for years, i’d definitely recommend trying a cleansing brush as it has worked wonders for me. The second step in my cleansing routine is to go in with a cleanser aimed towards acne/spot prone skin, and a favourite of mine is the Garnier Pure Active Sensitive Face Wash* (£4.99). This is essentially a gel like cleanser that foams up when massaged into the skin and helps to clear blemishes or keep blemishes at bay. I apply this just to my chin and my nose, as these are the areas that I struggle with in terms of blemishes. Again I then go in with the cleansing brush to further work the cleanser into the skin, and then rinse my face with water. I do find this cleanser can be a little drying, so I sometimes skip using this every other day or so but it fully depends if i’m having a good skin day or not, and I then ensure to apply a moisturiser to help with any dryness. So that is my current two step cleansing routine for keeping my skin clean but also clear of any blemishes. Some products featured in this post were previously sent for review.